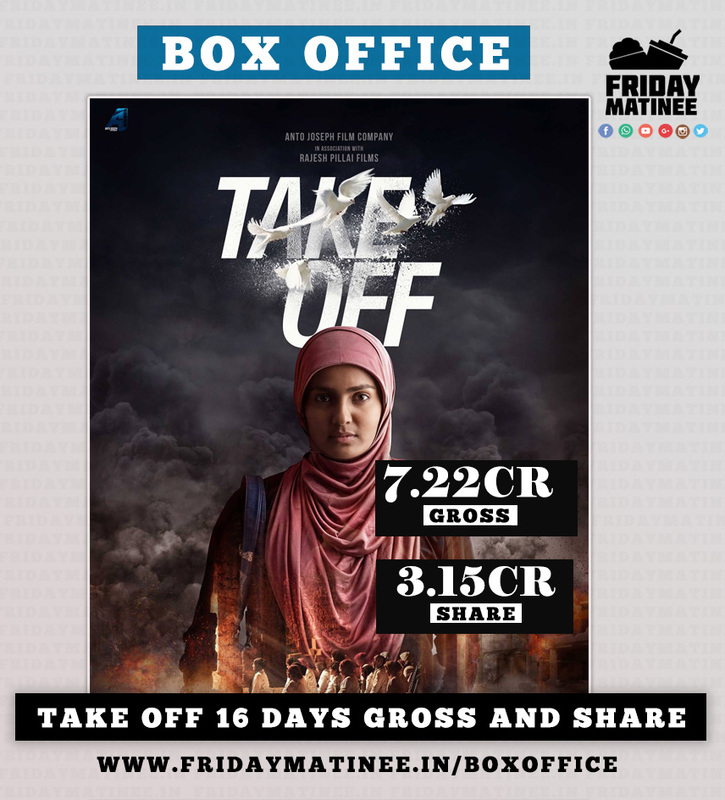 Take Off , a movie produced by Rajesh Pillai Films in memory of the pioneer of new generation malayalam cinema Rajesh Pillai opened to excellent reviews from both critics and audiences alike on 24th March 2017.The movie Stars Kunchacko Boban, Parvathy, Fahadh Faasil,Asif Ali,Divyaprabha in the lead roles. According to close sources from the distribution team we hear that this non-Superstar movie has grossed around 7.22 crores from Kerala alone with a distribution share of 3.15 crores in its 16 days of its run at Kerala box office. The movie also grossed a whooping 96 Lakhs from Cochin Multiplexes alone. The movie distributed by Anto Joseph Film company had there after performed excellently at the kerala box office inspiite of a streak releases including The Great Father,Georgettans Pooram and 1971 Beyond Borders.Film is based on the ordeal of Indian nurses from Iraq in 2014. The movie is the debut of Editor Mahesh Narayanan as a Director. The movie made at a budget of 9 crores has won praises from Ulaganayakan Kamal Haasan, Tamil Superstar Surya and upcoming Superstar Shivakarthikeyan. Verdict: Need a share of 5.10 crores to be termed as BO HIT.